As with other whitefish, the humpback whitefish digs no nest or redd but broadcasts its eggs which lodge in the gravel. The humpback whitefish is a medium sized fish up to 20 inches in total length. Humpback whitefish are distinguished from other whitefishes by the pronounced hump behind the head in adult fish with an inferior mouth, which means that the mouth that points downward, with the upper jaw being longer than the lower jaw. Sometimes referred to as a sub-terminal or ventral mouth, the inferior mouth is often protrusile, meaning it can be extended forward, sometimes a significant distance. This allows the fish to grab food particles or prey that would otherwise be out of reach. This is an adaptation often observed in bottom feeding fish such as the humpback whitefish. Adult humpback whitefish are generally dark brown to midnight blue dorsally fading to silver on sides with a white belly. The adipose fin is well developed and is often larger in male fish. The tail has a dark posterior edge. No parr marks are found on juvenile fish. Some populations of humpback whitefish are anadromous which means it spends part of its life in the ocean and part of its life in fresh water. Humpback whitefish are known to rear in channel ponds, sloughs, estuaries, and the marine environment until mature, when they migrate upstream to spawn. Age at first maturity for adult humpback whitefish seems to increase with latitude and occurs as young as 4 years old (in the Kuskokwim River) to as late as 11 years old (near the Arctic Ocean). Sexually mature humpback whitefish older than 30 years of age have been found in a number of rivers located within the Kuskokwim River drainage. Adult humpback whitefish undertake extreme spawning migrations into freshwater systems, traveling over 500 miles up the Kuskokwim River and over 1,300 miles up the Yukon River. Depending on her size, a female humpback whitefish may release up to 50,000 eggs. Whitefish eggs are negatively buoyant and non-adhesive. The female broadcasts her eggs over loosely compacted gravel beds in turbid and swiftly flowing water. The eggs presumably hatch in the spring and the young descend downstream to feed and rear. Juvenile humpback whitefish feed mainly on zooplankton, while adults feed mostly on benthic invertebrates including mollusks, crustaceans, and chironomid larvae. Adult humpback whitefish do not feed during spawning runs. Anadromous humpback whitefish typically migrate into freshwater systems in late spring to late summer to spawn. Spawning can occur from September through November, depending on the system. Humpback whitefish are known to spawn in the mainstem waters and tributaries of the Yukon, Kuskokwim, Tanana, Kvichak, Susitna, Copper, and Alsek Rivers. In Alaska, humpback whitefish is distributed throughout several water bodies within the Yukon River, Kuskokwim River, Tanana River, Kvichak River, Susitna River, Copper River, and Alsek River drainages. Several studies have been conducted on humpback whitefish populations by a number of agencies over the years. Research indicates that Susitna, Kuskokwim, and Yukon River populations are quite distinct. Such information is very useful when conducting mixed stock analysis on fish collections of unknown origin. It is clear that an understanding of humpback whitefish genetic population structure is necessary to identify appropriate management units for maintenance of biodiversity and productivity. Overall strength of humpback whitefish returns across the state between year and location seems quite strong based on anecdotal and harvest information. Although various state and federal agencies have conducted studies to estimate the relative abundance or model harvest impacts on local population of humpback whitefish, there is not sufficient data to assess the relative abundance of humpback whitefish within or between all known populations throughout the state. Potential overharvest from commercial, personal use or subsistence fisheries is the main threat to the resource. The migratory behavior of humpback whitefish makes the species susceptible to obstructions such as dams or habitat alteration, disturbance, or degradation. Because these fish rely on long-distance dispersals, efforts should continue to protect and identify the movement corridors that link critical habitat areas to ensure the long-term survival of humpback whitefish. The humpback whitefish is a medium-sized fish known to reach a length of 20 inches but is generally smaller. 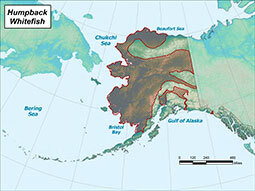 In Alaska, the humpback whitefish is distributed throughout several water bodies within the Yukon River, Tanana River, Kvichak River, Susitna River, Copper River and Alsek River drainages. Benthic invertebrates including mollusks, crustaceans, and insect larvae. Variety of marine mammals, fishes, and birds. Humpback whitefish have been observed returning to the same spawning grounds over several years.